This morning, I hauled out a fifty-pound bag of scratch grain to the chickens. As I was getting it awkwardly dumped into its bin, four of the girls eagerly clucked and chuckled around me. I figured the fifth was inside the coop laying, as it was right around the time they tend to produce their eggs. After getting everything settled, I poked walked around to the back side of their yard… and found Henry in a bloody, half-eaten pile. My heart tumbled into my stomach. It was very obvious she was dead; her abdominal cavity had been opened, her pectoral muscles were half-eaten, all of her neck and face pecked off and eaten. There were feathers everywhere. She was unrecognizable except by her absence. Immediately, I checked for signs of an intruder – a raccoon, a fox, a weasel, a burrow, scratches around the fenceline… nothing. I looked inside the coop, and there were signs of a tussle in there; small feathers strewn all across the room. Judging by her remains and the feathers inside and outside the coop, I think she was killed by the other girls. There were no teeth marks I found find on her body, no signs of breaking and entering, and the other girls were not freaked out as they were when the garter snake was in there. Most of her internal organs were intact – I think a predator would have been more complete in eating them. In the two days prior to her demise (which I am guessing happened yesterday evening,) Henry had been more hesitant to eat with the other girls, or to compete for the treats I tossed in. She acted very submissive and was easily startled off the greens if another hen so much as looked at her. She may have been sick, and died of an illness, or she could have been killed outright. Being pecked to death by other chickens would be a horrible, slow way to go. I can’t stand to think about it. Seems like we would have heard something… maybe it happened before I got home. I’m trying to remember if I saw her yesterday afternoon when I threw in some greens, but I honestly can’t. I know I saw her the day before yesterday, for sure. There were only a few ants on her body, but it was cool throughout. I took her inside and performed a brief necropsy to see if I could find any obvious signs of disease, and also to make sure I wasn’t missing some sign of depredation. All of her organs looked to be healthy and of the correct color. Nothing was swollen, no obvious signs of obstruction. What would have been today’s egg was in the oviduct. Its shell was thin and it was white, not brown. Farther up the tract, there were dozens of yolks in many stages of development. I hadn’t realized how much space inside a hen’s body is used for egg production. I really, truly hope she died before they got to her for two reasons: One, perhaps a more peaceful death; Two, if they took her out, they might do it again. Most importantly, I hope it wasn’t an intruding predator, because if it was, it will absolutely be back. And I have no idea how it got in. The coop is not an impenetrable fortress, by any means. A small weasel could have gotten in, but it seems like it would have eaten more of her carcass, and the girls would have been more spooked. At any rate, my little weirdo friend is dead, and I’ll miss her. I’m going to bury her in the far, unused corner of the garden, deeply, where she will be undisturbed. Oh, wow! How sad and awful!!!! 🙁 🙁 I don’t even know what else to say! And THIS is why I’m too chicken to have chickens…..I’m a sap. So sorry to hear this Erin. She was a very pretty lady. I very much liked her feather coloring. I hope she died peacefully. Not at all uncommon, Erin. My grandparents, both sets, kept chickens. They kept their chickens’ beaks trimmed to keep the cannibalism down to a manageable level, but the fact is that they do kill each other. Regularly. Disconcerting, but saves you from having to decide what to have for dinner. The strategy is to find the ringleader and eat her first. Selling her will just make her someone else’s problem. Phil, would you eat a chicken carcass that had been scavenged by some unknown animal and had been sitting out for unknown hours? After that same chicken had been acting a bit different lately and was possibly ill? If you would, that’s not very bright. If you wouldn’t, please spare me the glib comment about not having to decide what’s for dinner – I saw it the first time you posted it on Facebook. This animal was a pet, raised for the pleasure of her company as well as her eggs, as are the other girls. I will not be eating any of them. I remain uncertain of the cause of death. Heather, Nancy and Sharon – thank you. Yes, Erin, I suppose I would eat it, but I would consider it a stew chicken, not a fryer. 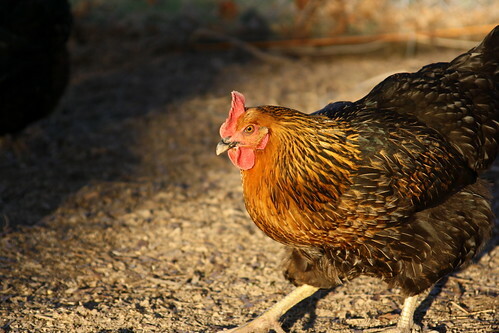 I realize that not everyone raises livestock for the same reasons, but I come from a pretty utilitarian culture that eats what it raises, and would view burying a pecked chicken as both sentimental and wasteful–i.e., not very bright. I am not uncertain as to the cause of death, because I have seen it before, several times. I’ll spare you the details on the alternate manifestations, but I think there’s *plenty* of evidence that you have a case of chicken cannibalism on your hands, and more importantly, you should assume that it *will* happen again until you change the dietary and/or environmental factors that brought it on.